If you have a soft spot for novelty prints like myself, these vintage Moschino pieces I found on Etsy will definitely make your day. Moschino never disappoints when it comes down to delivering a great conversation piece, and these vintage pieces will prove just that. 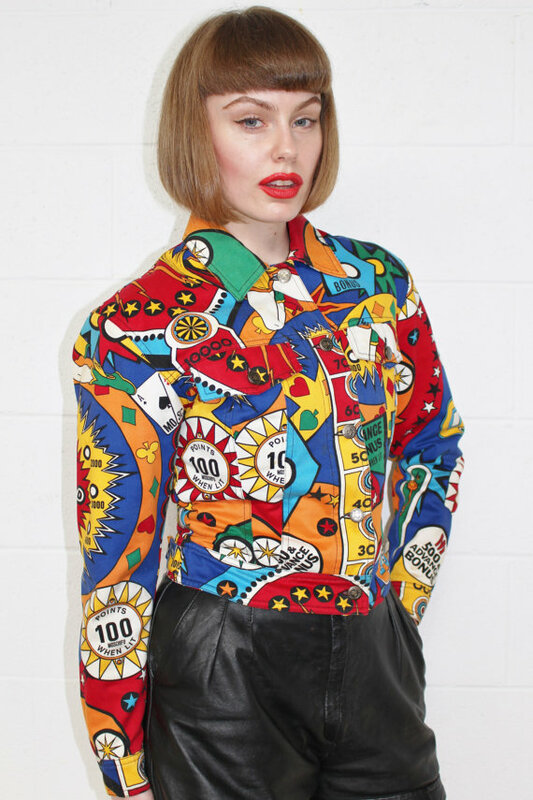 This pinball printed jacket from The Garmery is a trendsetter’s dream. I fell in love with the bright colors and cool prints. Feeling extra bold? Throw another print or highlight one of hues that’s already in the jacket. Not willing to take that extra step yet? Keep it simple by pairing it with a black or white bottom. Now I wouldn’t even think of owning a soccer printed blazer, but after looking at this jacket, I don’t think it will be too bad. This blazer paired with a ruffled skirt and a gold necklace is perfection. Gin Rummy, Hearts, Go Fish? Showcase your love for playing cards with this skirt from Millesime Collection. This number printed blazer is good for beginners who are trying to introduce prints into their wardrobe. Because of the black background, styling this jacket is effortless—especially if you’re not willing to go the extra mile just yet. Can’t get enough of these vintage Moschino garments, head on over to Etsy to gawk at more pieces. Tags: Fashion, geeky clothes, moschino, novelty print blazer, novelty print skirt, quirky printed blazers, quirky printed clothes, style inspiration, vintage moschino, vintage moschino soccer printblazer, where to buy vintage moschino. Bookmark the permalink. Previous post ← Are Oversized Garments The New Fitted?